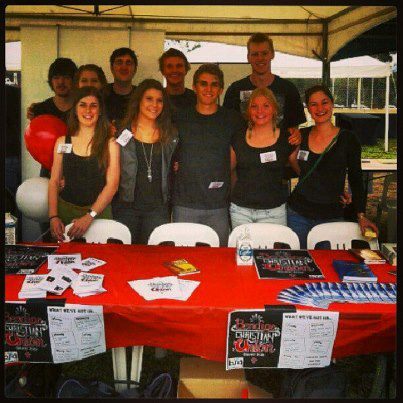 Latrobe Bendigo Kicks off Semester 2 with Bruce Week! Bruce Week is a great week to have fun catching up after the mid year break. It’s also a great time to meet new students who might be starting their study here at Bendigo for the first time. CU’ers will be around on campus most days wearing their black t-shirts, come and find us at market Day (Wed) for a free Hot Chocolate! 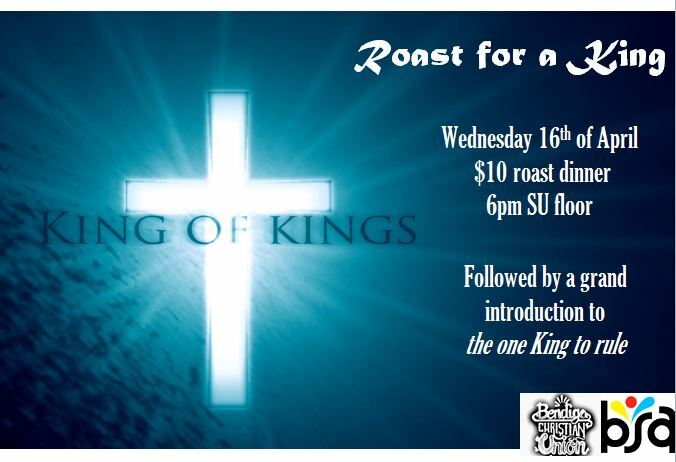 Easter Event – $10 Roast Dinner! This Wed (16th) we’re celebrating Easter by having an amazing Roast dinner! Will be great to see you there! La Trobe Bendigo is a great place to study, but it is also a great place to grow as a Christian. Whether you’re straight from school or a few more years down the track we’d love to have you join us at Christian Union (CU). CU is the recognised university Christian club that meets on campus to encourage each other in our faith, regularly hear from the Bible, seeking to grow in godliness and to share the good news of Jesus with those around us. If you’re not a Christian, but are interested to check out the club, and more importantly look into who Jesus is and what He’s done for you – you’re always very welcome! If you’d like to know more, get in touch with us on the contacts page or come and visit our Wednesday Night Gospel Gathering! Wed 17th Mar – Gospel Gathering. 6pm Rm228 Bus. Free Dinner! 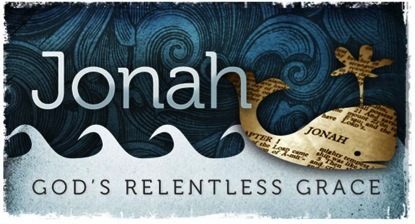 CU will launch into Semester 2 with 4 weeks in the book of Jonah at our Wednesday night Gospel Gatherings. ‘Why Jonah?’ you might ask. What could the story of a man and a fish 800 years before Jesus have to do with us at Uni today? Well I’d say more than you might think. Although we probably all know the story of Jonah (how Jonah refused God’s call and ended up inside a huge fish) I think most of us miss two big things. Firstly we get so puzzled by Jonah and what he does that we fail to see that we are so often just like him. Secondly, we get so focused on the great fish that we miss the fact that Jonah is a story not about a man and a very great fish but about all men and a very gracious God. 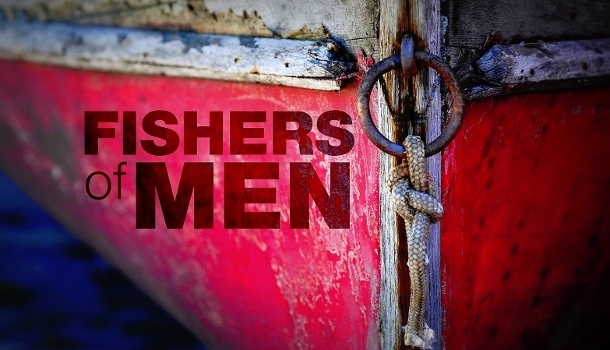 As we look at Jonah together we’ll get to know him to be a man just like us. We’ll see that Jonah, like us, lives among pagans who know next to nothing about God. We’ll see that, like us, Jonah is called to speak God’s message yet he’s a terribly reluctant evangelist – we’ll take time to consider why. We’ll be encouraged as we see pagan sailors and city-dwellers repent. Yet all along we’ll be challenged about how we view those who don’t know God, particularly as we reach the last climactic cliff-hanger of a question. who extends great grace towards ‘outsiders’, and exercises great patience with ‘insiders’. We meet the God who is the most committed evangelist of all, the God who sent his own Son to become the man Jesus – Jesus who spoke of Jonah’s experiences to explain his own death and resurrection. As we open up the book of Jonah we’ll discover more of the amazing character of our God, and I pray we’ll be encouraged to share the heart of the greatest evangelist—the Lord Jesus Himself. Why not take 20 minutes now and read through this great part of God’s word for yourself? 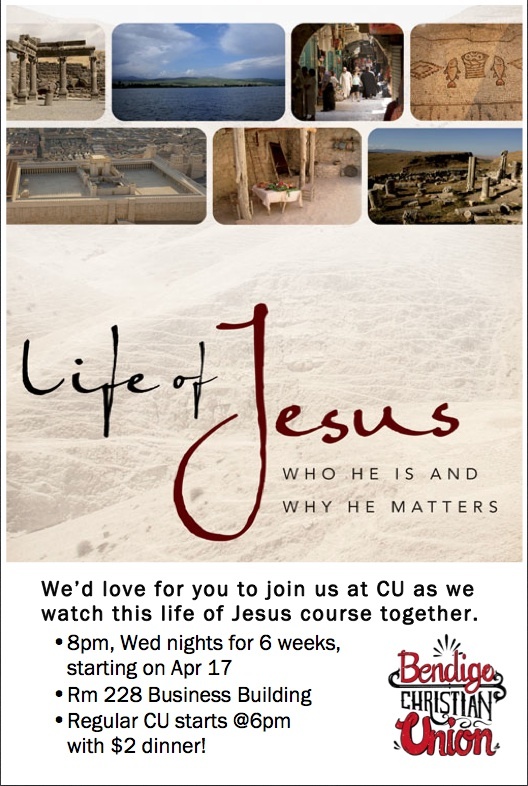 Join us for ‘Life of Jesus’, a six week course on Wednesdays 8pm, starting 17 April, in the Business Building (Rm 228). Easter Event: Jesus said WHAT? 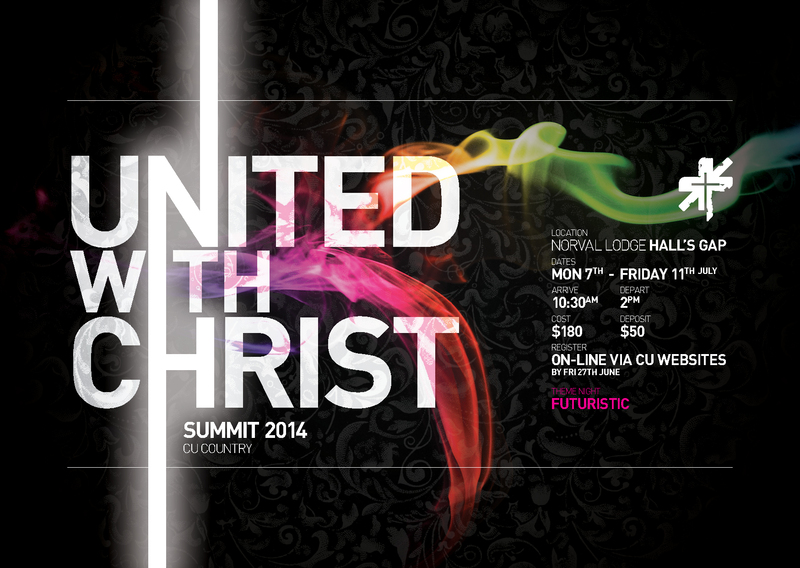 Join Christian Union on Wednesday night to celebrate Easter. We’ll enjoy a lamb roast, Bible talk and a chance for you to ask your questions about Easter and Christianity. We’d love to celebrate Easter with you! God has revealed himself as Father, Son and Spirit. As if the idea of three persons and one God was confusing enough, many people have questions about the Holy Spirit in particular. What is his role? How does he relate to the experience of the Christian? What does the Bible say? 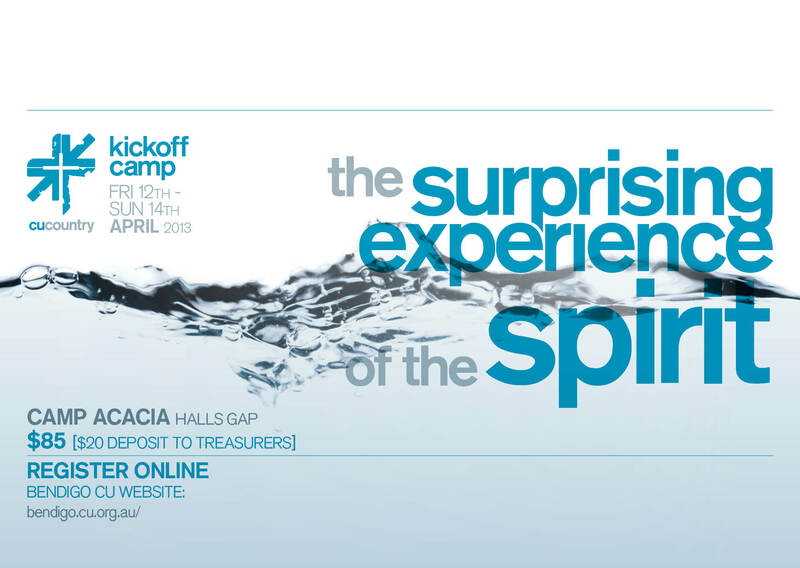 Come along to Kick Off Camp to find out about the surprising experience of the Spirit and enjoy fellowship with CUs from Ballarat, Bendigo and Geelong. 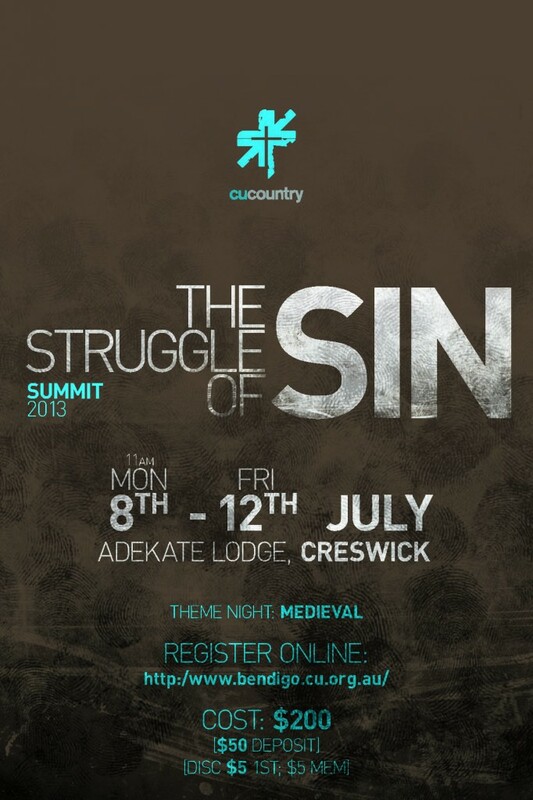 Date: Friday 12th to Sunday 14th April 2013. Venue: Camp Acacia, Halls Gap (map). Cost: $85. Deposit $20 to staff or campus treasurer. Register Online.